There aren’t many moments in a creative career which you can identify as an actual breakthrough. Improvements come gradually, countless tiny adjustments, accumulating over years into something meaningful. 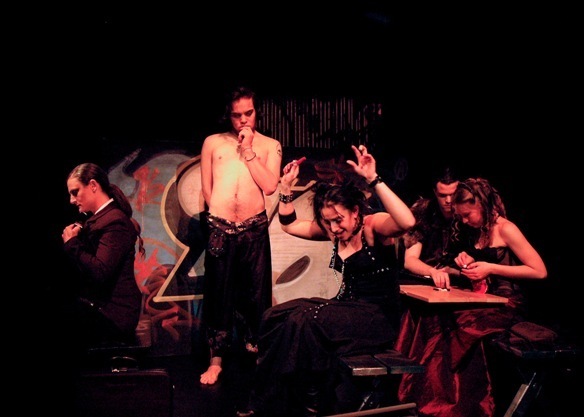 In 2004 I was developing a new script entitled Vampire Play for Bohemian. I had the bones of a script, some scene outlines and a few fragments of dialogue. In the room with the actors, I gradually fleshed this out into a proper script. bekken – Guys! This is the first ambush ever made by the Vampire Gang. We’re gonna do the most complicated plan, with heaps of strategy and tactics. This was a gamechanger for me. I had so many great ideas for plays that I had abandoned because to do them justice would require more skill than I had. Now I realised: I didn’t need to do them justice. You don’t need research. You don’t need careful development. Screw careful writing. Put the ideas straight into the work, raw and unformed. Don’t worry that they’re clunky and half-baked: make a point of it. Celebrate it! From this point on, highlighting mistakes and drawing attention to weaknesses became a core part of my creative tooklit. Rather than avoiding extravagant setpieces in my work, I started doubling down on them. I stopped worrying about how to stage the scripts I wrote, and left all the practical stuff to directors and designers. The unexpected solutions people found to these staging problems were usually the best parts of the show, so I started experimenting with increasingly impossible demands. I stopped trying to find connecting threads between the disparate ideas in my scripts, and gave myself permission to include whatever idea excited me in the moment, regardless of whether or not it logically ‘fit’. I let contrasting elements sit together in my work without justification. This can be powerful. As humans, we’re wired to look for connections and patterns. If you place two ideas next to each other in a work, sooner or later a connection will emerge. Maybe a collaborator or audience member will point out a relationship you never spotted. These links are usually more interesting than the ones you made consciously. I took a lot of inspiration from reading an early draft of Declan Greene’s Pompeii LA. Declan had started the project with a tumblr blog, a scrapbook of child star-related links, articles and videos, anything that caught his eye. The script wasn’t a scrapbook, but in some ways it felt like one. Fragmentary scenes from cheap TV talk shows ran up against surreal lyric monologues about volcanoes. When I saw the final version at the Malthouse several years later, it had grown sharper and cleaner, but I felt like part of its strength was the eclectic, weird web of ideas it was grounded in. 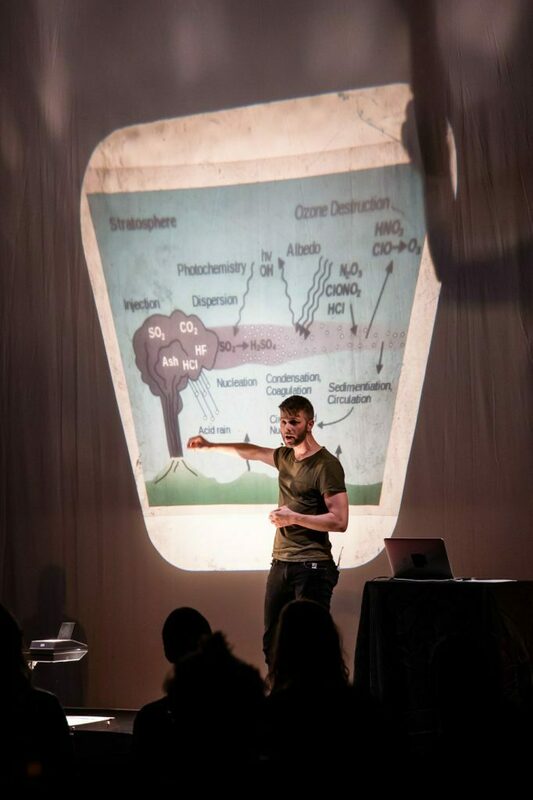 Making science-theatre, I used to endlessly worry about my work feeling like a lecture. I used to go to huge lengths to carefully conceal any science ideas. And then I finally figured out the solution: I stopped worrying about it. 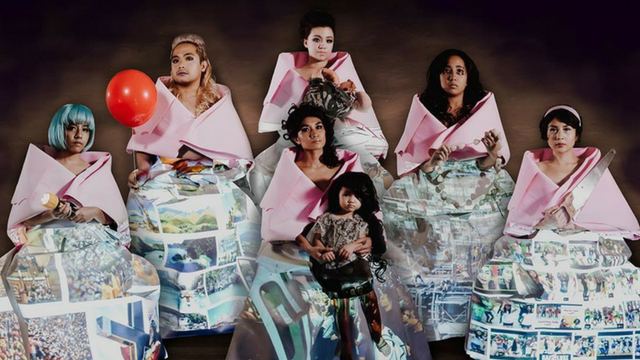 How do you tell the story of climate catastrophe on stage without it feeling like a lecture? You run toward the science, challenge the media and make it a lecture. And combine it with a dance party. This may look like a lecture, but it is, in fact, a lecture. Pic by Bryony Jackson. It turns out, the problem is actually the solution. This is an endlessly flexible strategy. Make a list of the problems and flaws in your current project. Don’t try to solve them. Highlight them. Celebrate them! These things are impossible to quantify, but I feel like this is the trick that’s allowed me to stay in the game. I’ve never been the most talented playwright, nor the most hardworking and dedicated. Plenty of my peers are more skilled writers of dialogue and character, more able to connect with audiences emotionally. I’ve managed to remain in the game partly because I’ve been able to turn my weaknesses into stylistic features – part of my aesthetic. The problem with this approach, of course, is that it lets you off the hook. Making a feature of your flaws can absolve you of the need to address them. Over a long period, it can stifle your creative development. My writing craft is, frankly, not where I want it to be. At this stage of my career, at age 35, I think the actual content of my writing is more interesting than ever before. But my grasp of the fundamental skills of playwriting is patchier than it should be. There are things I just can’t write that I wish I could. Characters: How do you make them? Dialogue with more than two people: How do you script it? Realism (aka the most popular performance form of this era): What even is that? I’m thinking about how to go forwards from here, continuing to use the tricks and techniques which have worked for me, but expanding my palette and building my skills. I have a long way to go. I guess we all have a long way to go. Life business. A few weeks left in London, and I’m doing a couple of performance sharings. On Monday 15 October I’m giving a talk about Sipat Lawin and the Battalia Royale project, and also chatting a little bit about Are You Ready To Take The Law Into Your Own Hands. JK Anicoche is joining remotely (skype willing) and Tassos Stevens is chairing – head here for details. On Tuesday 16 October I’m doing a little sharing of a new project which right now is just going by the name Objects. RSVP here for details. Speaking of Sipat: the rest of the crew just completed a residency for Gobyerno in Kinosaki, Japan – a realignment and exploration for the next stage of this project (as well as doing an adorable Gobyerno for kids workshop). And in Australia, Boho is rolling out a set of workshops this month, for the Torres Strait Island Research Council, and the SafeWork NSW Conference. As ever, check out the website if you’d like to inquire.